Reach 11, in north Phoenix, is part of the city’s Parks and Recreation Department but it exists for flood control. A 7-mile long earthen dam keeps flood waters out of the nearby canal and out of housing developments to the south. The area where the nature trails are is only about 1 mile wide. Amazingly, this place is not well-known at all. I only heard about it from some birders recently. Driving down the busy street where the entrance is, one would never know what a beautiful place it is. Someone described it as a “hidden gem,” and it really is. From the street it just looks like desert scrub. 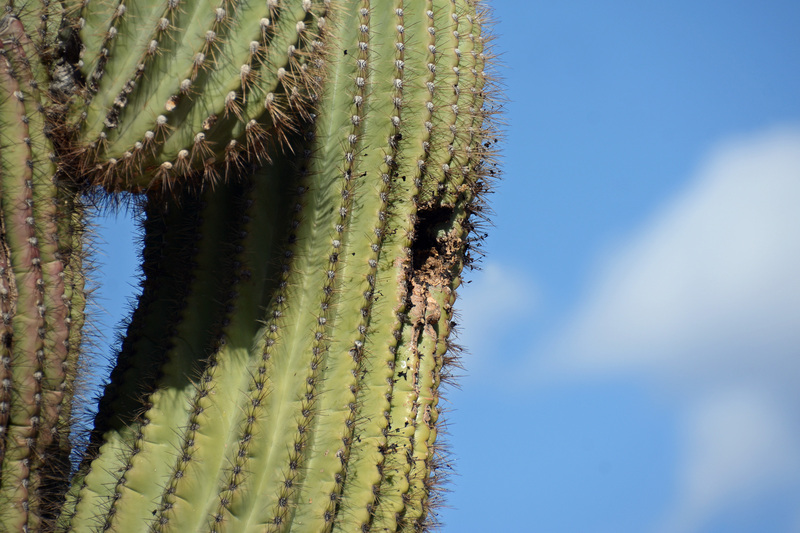 This poor, old, decrepit saguaro is at the beginning of the trail. We saw a bird fly into it so stopped to watch. It’s a male Gila Woodpecker. There must be a nest in there. A European Starling. It had a nest in one of the center holes and kept flying in and out with food. We could hear babies chirping every time a delivery was made. We stayed on the trail and didn’t disrupt the nesters but I’m sure they were pleased we left. 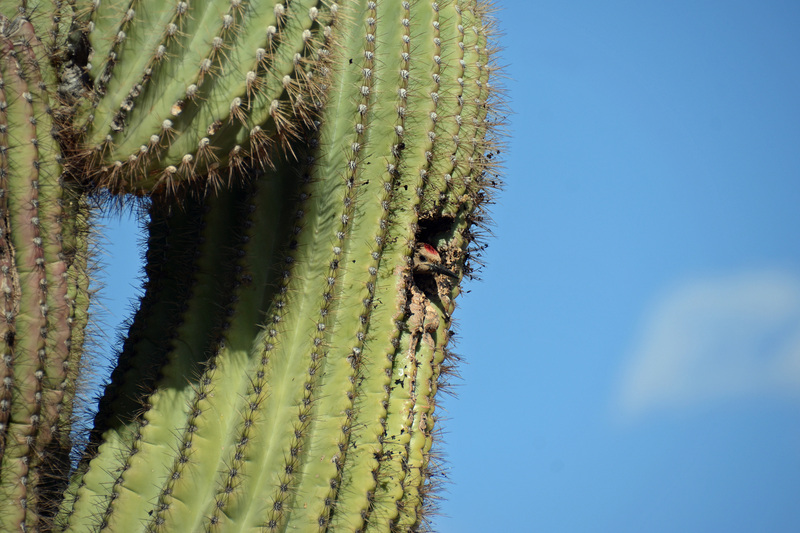 We also saw another Starling head into a hole in the back so this saguaro is home to at least 4 different nests now. Who knows what else might be living in there? The wind was really blowing hard and gusting while we were there so I hope when that poor saguaro falls that there are no nests left. After we walked a little more, we started to see the “hidden gem” part of this area. It was very lush back in there, all sorts of grasses, wildflowers, etc. There was a mesquite bosque and a little hidden pond in there, full of tadpoles, called Bullfrog Pond. It was really peaceful and pretty. No one was around but one biker. I know this place is teeming with birds and other wildlife but it was so windy that day that the birds were having a hard time staying airborne. It’s definitely a place we will return to as it’s only about 20 minutes from our house and very unique. *The reason this recreation area is called “Reach 11” is because it’s on the 11th reach of the Central Arizona Project canal. Across the street from the nature trail is a huge sports complex with 20 soccer fields, an equestrian area, and more. Much like the McDowell Sonoran Preserve in Scottsdale, the Phoenix Sonoran Preserve, located in North Phoenix, has over 18,000 acres of beautiful desert views including 36 miles of exciting multi-use trails. The wildflowers were just beginning to bloom but the tons of Chollas were glowing in the sun. We were at the Apache Wash Trailhead where a mountain biker crashed into a rattlesnake that same day and was bit. We did see an ambulance but didn’t know about this until seeing it on the news that night. It’s rattler season. The female Black-throated Sparrow is the nest builder (you can see her gathered materials in her bill) and a breeding pair is very territorial so the one on the nearby cactus must have been her mate. These two were also together so I imagine they are mates, too. There were really pretty views here. It was hazy but in the distance, we could see Four Peaks, 42 miles away, as the crow flies, still covered with the recent snow. It’s been in the 80s the last couple of days; the snow has all melted. Spring is coming to the desert. I thought the birds would be a little more active. We did see a lot of quail, doves, starlings but I didn’t take photos of them. We also saw a cute little wren that I would have liked to get a photo of to identify it but it wasn’t cooperative. Volunteer 100 hours at Desert Botanical Garden. Not even close (compared to 102.75 in 2017). Find 50 new Lifers (new birds). Found 36 (compared to 58 in 2017). Go on many AZ day trips with Tony. Went on 16 (compared to 23 in 2017). Maybe volunteer at Desert Botanical Garden, maybe not. Maybe elsewhere, maybe not. Go on as many day trips with Tony as we can. Take as many photos as I can. These were my first bird photos of 2019. It was cloudy, cold, and rainy so they were from my yard only. The hummers were all fluffed up. Hope your year is off to a good start and that you have many exciting goals…or no goals…but fun times ahead.